Considered one of the oldest art museums in the nation, the Cincinnati Art Museum in Cincinnati, Ohio was begun in 1881 and was the first purposely constructed art museum west of the Alleghenies. Housing over 60,000 works of art, it contains one of the most comprehensive collections in the country, and the Romanesque-revival structure was designed by local architect James McLaughlin. Over its 120 year history, there have been many changes and additions that have altered the original building, with the latest happening in 2003, the Cincinnati Wing that contains works by or for the residents of the city. The new wing contains 15 new galleries that unfold into 18,000 square feet of space holding 400 objects. Two of the biggest pieces in this collection are the Odoardo Fantacchiotti angels that were originally made for the main altar of the St. Peter in Chains Cathedral in the latter part of the 1840s. These were some of the first European sculptures that came to the city, with other works by Luman Watson, Frank Duveneck, Robert Scott Duncanson and Rookwood Pottery. 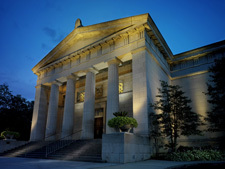 During the last part of the 19th century, public art museums were something of a new novelty, particularly as far west as Cincinnati, but after the wonderful success of the 1876 Centennial Exhibition that was held in Philadelphia, the Women's Art Museum Association was created in Cincinnati so that art could be brought to the city for the benefit and enjoyment of all. As enthusiasm grew, the Cincinnati Museum Association was formed in 1881 and in 1886, a brand new building was finished in Eden Park that was soon known worldwide as the Art Palace of the West. The citizenry of the city continued to support the museum, and the marvelous donations that came from many important Cincinnatians increased the collection to the tens of thousands which in turn created the need for more space. The Schmidlapp Wing opened in 1907, that was continued with many more projects that added space to the museum. The Emery, Hanna and French wings that opened in the 1930s, enclosed the courtyard and allowed the museum to continue its rectangular shape and added space for the Asian, American and European collections to be shown permanently. As time continued forward, the collections grew and magnified and in 1993, the $13 million project that was to restore the interior's architecture soon uncovered many hidden architectural details. The collections span some 6000 years of history that includes the artworks of Africa, America, near and far east art, and the ancient art of Rome, Greece and Egypt that contain decorative arts, contemporary art, drawings, photographs, costumes, textiles, paintings and prints. The paintings include works by masters Rubens, Titian, van Dyck, Gainsborough, Miro, Picasso, Renoir, Braque, Chagall, Derain and Modigiliani from Europe, while the Americans are represented by Harnett, Rothko, Wood, Hopper, Cole, Wyeth, Copley and Diebenkorn. A few of the many treasures you will find here include the only collection of ancient Nabataean art out of the country of Jordan, a spectacular collection of American and European portrait miniatures and the famous Herbert Greer French collection of old master prints. The BEST car rental deals are happening right now at Alamo Rental Cars. The Alamo Printable Coupons program is helping Americans save money in these hard economic times. Go to the Alamo web site today and take advantage of the new Alamo Coupons programs. Dayton Apt Alamo Car Rentals - 3600 Terminal Dr. The Cincinnati Zoo and Botanical Garden opened in 1875, a little over a year after the Philadelphia Zoo, and thus became the second zoo that was created in this country. The reptile house is now the oldest zoo structure in the nation since it was built in 1875. It is found in the Cincinnati, Ohio neighborhood of Avondale and set on 65 acres in the center of the city; with numerous blocks around the area being added later and some reserves that are located in the outer suburbs. Famous for its breeding programs, the zoo has them for white Bengal tigers, lowland gorillas, black rhinoceros and especially for cheetahs. A bonobo was born at the zoo in 2003, that brought the total of those animals to 60 in this country with 7 in this zoo. This cute little fellow was called the pygmy chimpanzee, and is found only in the Democratic Republic of the Congo and is endangered. The zoo has been the last home of Martha, the last surviving passenger pigeon, who passed on in 1914, the last Carolina parakeet that passed in 1918 and is now the home of the Diana monkey, the Congo peafowl, the mantled guereza and the California sea lion. 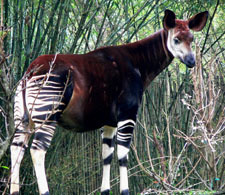 Major displays include; the cat house where the ocelots, fishing cats, black-footed cats, caracals, Pallas cat and leopards can be found, the elephant house that holds the Indian elephants, the Gibbon Islands that is home to the Siamang and gibbons, the giraffe ridge where the Masai giraffes live, Gorilla World is home to the western lowland gorilla, Jungle Trails where the bonobos, sumatran orangutans and primates live, Kroger Lords of the Arctic for polar bears and bald eagles, Penguin Walkabout with little and African penguins, Lemur Lookout for ring-tailed lemurs, Monkey Island is home to snow monkeys and Japanese macaques, Marge Schott-Unnewehr Elephant Reserve houses Asian elephants, Passenger Pigeon Memorial, Nocturnal House for bearcats, aardvarks and bats, P & G discovery forest that contains the two-toed sloth, boa constrictor, toucan and blue and gold macaw, reptile house with their Burmese pythons, king cobras and Chinese alligators, World of the Insect that has giant walking sticks and leaf-cutting ants, rhino reserve is home to black and Indian rhinos, Siegfried & Roy's white lions of Timbavati that has a rare white lion, wolf woods has river otters and Mexican wolves, Spaulding Lorikeet Landing for lorikeets, Tiger Canyon is home to cheetahs and tigers, Wetland Trails & Swan Lake with its trumpeter swans, mallards and other native wildlife, Wildlife Canyon & Sumatran rhino has also rhim gazelles, Takin, Przewalski's horse and other hoofed critters, and the Spaulding Children's Zoo.